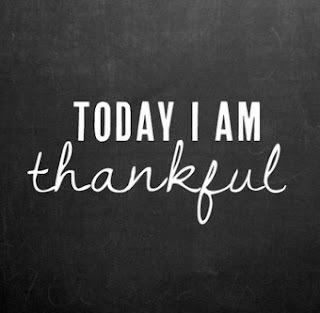 I try to be thankful. I like to think I'm thankful. But how thankful am I really? I was challenged when I read this question: If you only had what you gave thanks for, what would you have? My family. My health. Food. Shelter. My car. Friends. Fun experiences. I'm a lot like my kids. I tend to thank God for the same things over and over. I'm not that creative. This question made me think deeper. Have I ever thanked God for my toothbrush? My morning coffee? Really great chocolate? Do I stop to thank God for my computer that I type this on? What about the towels that I use after my shower? What about the shower? What about hot water? There's a lot I take for granted most days. I want to try to be thankful in each moment. Thankful for warm pajamas on a cold night. Thankful for a song played at just the right time. Thankful for the medication that helps me feel better. Thankful for peace that goes beyond all understanding. Thankful for my God who provides everything I need. My husband is thankful for his heart attack because it's forced him to eat healthy. My son often thanks God for his warm cozy bed. If you only had what you've thanked God for, what would you have? Lord, help me to live in a spirit of thanksgiving each and every day.